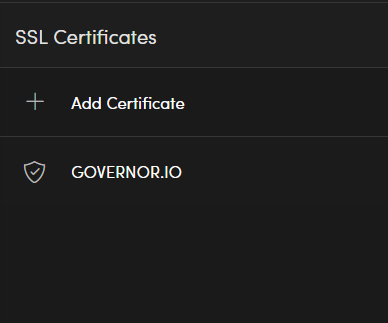 You can secure your governor website using an SSL certificate purchased from any trusted certificate authority. Governor supports both single domain and wildcard domain certificates. 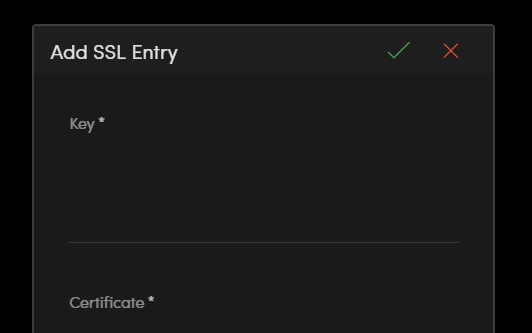 To upload your certificate first visit the SSL section under Settings in your sites dashboard. You will be prompted to enter your key, certificate, and bundle. Open each file in a text editor and copy the contents into the appropriate inputs for the key, certificate, and chain. Select the green check to save the certificate and key to your site. You will now see your certificate listed. Ensure the domain name listed matches the domain for your site. Once your SSL certificate has been uploaded, you're ready to bind it to your domain. 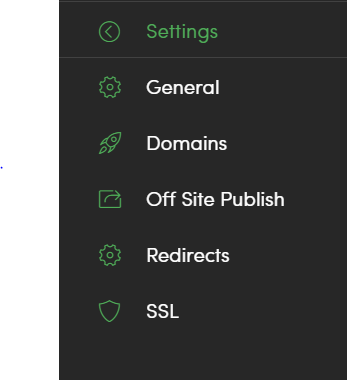 In the Domains tab under Settings, you can bind each configured domain to an installed SSL certificate. To bind a domain simply choose the certificate you wish to bind from the associated dropdown. Once you have bound your certificate(s) to your domain(s) Save the changes to your domain settings. To force HTTPS on your site. Find the "Force HTTPS?" toggle located in domain settings and turn it on. Once enabled, all HTTP requests will be redirected to HTTPS.